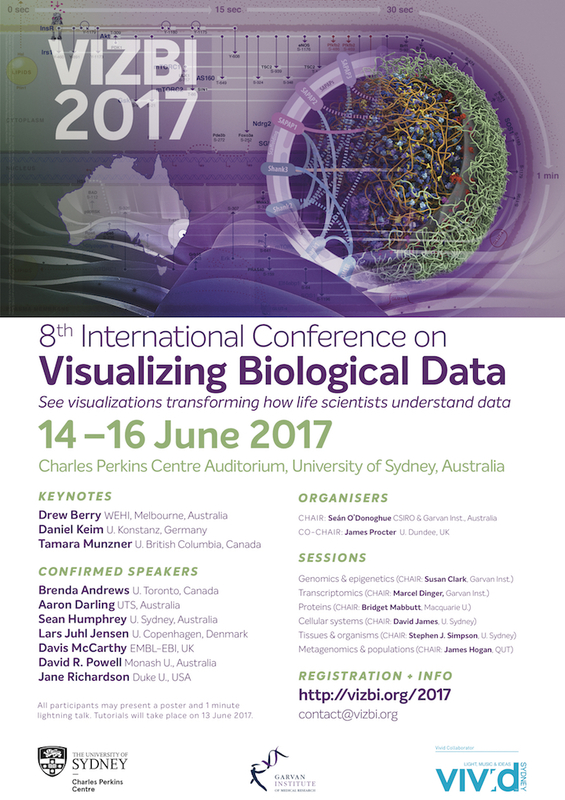 VIZBI 2017, the 8th international meeting on ‘Visualizing Biological Data’, will take place 14-16 June 2017 at the Charles Perkins Centre in Sydney, Australia, sponsored by the Garvan Institute of Medical Research, The University of Sydney, and Destination New South Wales. VIZBI 2017 features keynotes from Daniel Keim, Tamara Munzner, and Drew Berry, and talks from 18 world-leading researchers showcasing visualizations transforming how life scientists view data, and driving key advances in molecular biology, systems biology, biomedical science, and ecology. The conference brings together a diverse community, including bioinformaticians, data scientists, computer scientists, and experimentalists, as well as medical illustrators, graphic designers, and graphic artists. VIZBI 2017 will be part of Vivid Sydney – a spectacular festival of light, music, and ideas – strong synergies between these events give extra incentive to make the trip to Sydney. All participants have the opportunity to present a poster and a lightning talk describing their work. If you cannot join us in Sydney, you have the option of virtual registration, which allows participation via streaming video and chat. Tutorial proposals. Prior to the meeting (June 13), there will also be half-day tutorials on visualization tools & methods. If you are interested in running a tutorial, you are invited to submit a tutorial proposal (deadline: 20 March 2017). As with previous meetings, VIZBI 2017 promises to be an exciting event that will again help raise the standard of data visualization in the life sciences. We hope very much you can join us!